Health is central to development and is a precondition for, as well as an indicator and an outcome of progress in sustainable development. It is therefore essential that Zambia achieves universal health coverage at every stage of life, with particular emphasis on primary health services, including mental and reproductive health, to ensure that all people receive quality health services without distress of financial hardship. According to a study carried out by Ministry of Health and Central Statistical Office on Zambia Household Health Expenditure and Utilization (ZHHEUS, 2015) only 3.9% of Zambians have health insurance cover while the remaining 96% of the population depend on out of pocket payments when accessing health services. The above statistics if not addressed would cause Zambia not fully achieve Sustainable Development Goal (SDG) number 3 which attempts to promote healthy lives and wellbeing for all at all ages by 2030. The introduction of National Health Insurance is a step in ensuring that 100% of the populations have access to health care services through the scheme. 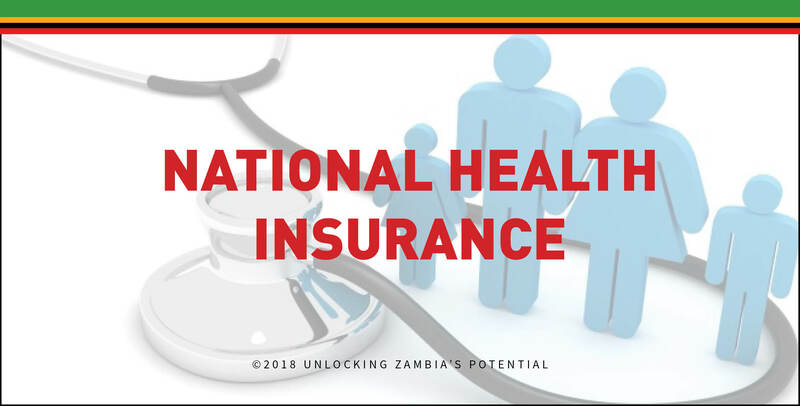 Consultations on the National Health Insurance Bill started as early as 2012 and since then the Ministry of Health has continued to successively engage with various stakeholders on the formulation of the National Social Health Insurance Bill. These engagements with various trade unions and other key stakeholders in the health sector were coupled with general consultations validated by the Zambia Household Health Expenditure and Utilization Survey (ZHHEUS, 2015). Nation-wide consultative meetings and best practice comparative studies spearheaded by a technical working group to ensure that all stakeholders views and concerns about the enactment of the Bill are taken in to consideration. The National Health Insurance Scheme is a system of health insurance that covers a national population against cost of healthcare. In most cases the scheme is administered by the public sector or the private sector, and in some instances a combination of both. Similarly, While there is no standard definition of what health insurance is, it is widely defined and perceived to be ‘a financial protection mechanism, for healthcare, through health risk sharing and fund pooling for a larger group of the population’ (WHO,2003). The main goal of the scheme is to cover all citizens who are exposed to health-related financial risks by eliminating the need for out of pocket payments for health services. This model of health financing is beneficial to the population in the sense that, it offers a secured and sustainable financing model for the improved provision of drugs, health personnel recruitment, infrastructure development, and improved health information management system for better health care provisions for a country. It is against this background that the government has formulated and intends to implement the National Health Insurance Act, which was formulated based on the Solidarity Model. The Solidarity Model of public health financing is a concept widely utilized by many countries to reduce costs and increase efficiency and effectiveness in a nations health sector. Although various countries have different country-fitted health insurance scheme structures, the concept of a Solidarity Based Model of health insurance financing can be identified in many of them. By definition, the modern meaning of solidarity in health insurance refers to the equal treatment for all social groups (elderly, low- income, immigrants, disabled etc.) anchored on a contributory based system mandating that all working citizens must join the same contributory health financing fund (Saltman R. 2015). Members of these schemes are usually nationals and residents who pay on average between 6-10% of their income to the scheme/fund, which is widely accessible to the general population at various levels (different packages). The concept is meant to provide for sustainable health financing through the equitable and fair collection of contributions. The model is intended to expand coverage for vulnerable groups such as the chronically ill and elderly and although there may be numerous arguments as to whether or not this must be supported is based on the moral fibre of the policy makers and general citizenry. Provide for complaints and appeals processes and provide for the progressive establishment of provincial and district health offices of the Authority. The Bill, will provide for the establishment of the National Health Insurance Scheme into which contributions will be made for financing of the different categories of the insurance scheme. These contributions will form a fund that will be utilized to administer the payment of the cost of insured health care services accessed by members of the scheme. This funding model will reduce the Out of Pocket Payments (OPP) that are currently being used to access all required medical services despite the removal of user fees in public health service centres. Contribution of 2% of income will be made towards the insurance. The employer will contribute 1% of income while the employee will also contribute 1%. Managers of pension schemes will make contributions for retirees. Self- employed citizens will make contributions towards the scheme as well. Mentally or physically disabled persons who are unable to work. Elderly persons above the age of 70. Persons classified as incapacitated by Ministry of Community Development and Social Welfare. Reduction in barriers to health care access– despite the removal of user fees in public health service provision, most Zambians especially in rural areas still find it difficult to access health care services because of financial and non-financial costs they incur when accessing medical attention. These out of pocket payments include travel costs, expenses on drugs or medical investigations not available at public facilities, with the introduction of the national health insurance there will be a reduction in the challenges that come with out of pocket payments. Improved health care provision– the implementation of Health Insurance Financing Model will improve the quality of health care in the country because it will provide sustainable financing to the sector which will not be affected by annual budgetary constraints. This Insurance fund will be used to provide optimal support to the sector through provision of drugs, basic diagnostics and improved human resource in the sector. Improved health infrastructure – the National Health Insurance Scheme will foster the development of health infrastructure especially in rural areas. Improvement of infrastructure will reduce the long distances that most people in the rural areas face when accessing health care. Improved infrastructure will foster improved information storage and management through investment in information and communication technology needed in the health sector. Improved demand for health care – according to the Zambia Household Health Expenditure and Utilization Survey (ZHHEUS) 38.3% of 15million Zambians do not report illness or visit health care facilities and only about 21.3% do. These who do not report illness attribute it mainly to distance, cost of health care service and some perceived poor quality of health care services in public healthcare facilities. With the introduction of the National Health Insurance Scheme which will lead to the improvement of health care services and reduction in the out of pocket payments, the demand for health care services will increase and this will result in a reduction of mortality. Government should ensure adequate number of health personal and facilities for the This can be achieved by getting more of the private sector players onto the scheme through incentives such as tax exemptions on importation of specialised medical equipment. The Government should put up a system that will ensure prompt remittance of the contributions to the scheme and a quick repayment mechanism to participation health care providers. The Government should set up a monitoring and evaluation system for the for continuous monitoring and review of the operations of the scheme in a manner that will provide for accountability and justification of the implementation of the scheme. PMRC would like to urge all citizens and organizations to understand the contents of the Bill as it is a milestone in the efforts towards universal healthcare services for all and improved service delivery in the Zambian health sector.